With 2019 marking the 100th year since the infamous Black Sox scandal, a lot of content is expected to be pushed out on the interwebs throughout the upcoming baseball season about the dark tale and bring up endless, unanswerable questions. Hey, it’s a fantastic and fascinating debate, after all. Inevitably, movies like Eight Men Out and of course, Field of Dreams will be discussed as well. While both are excellent in their own right, there are some inherent issues that come with book adaptations – largely the famous curse of being “Hollywooded up.” It happens. Eight Men Out is based on Eliot Asinof’s 1963 book that, while largely true, was even more largely unsubstantiated. A significant portion of that book and film in fact, is about as fictional as Field of Dreams. That film, based on W.P. 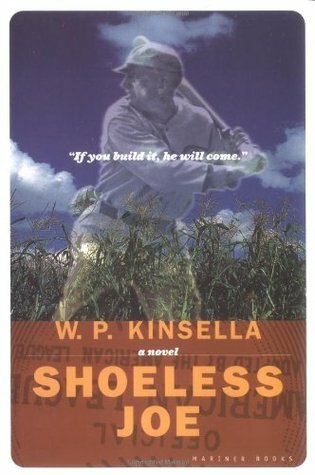 Kinsella’s tremendous novel, Shoeless Joe, has been revered by millions since it’s release 30 years ago. As a diehard fan of both book and film, I’ve read and seen each countless times and neither ever tires. Obviously, many more people have seen the film than have read the book, however, and while I wish every fan of the film would read Shoeless Joe, one can still get a good enough grasp of things without – because the film is pretty amazing. In my (probably unpopular) opinion, no. Ray hears a voice, and while he technically misunderstands it at first, he believes so strongly in what it means that he takes immediate action. The Kinsellas were barely making a profit from their farm as it were, and to remove crucial acres of your main crop to build a baseball field would not be very wise. But Ray believed in the power of faith, and went ahead with his endeavor nonetheless. Annie did too, for she could have tried harder to talk him out of it (in the book she doesn’t talk him out of it whatsoever), but she, too, believed because Ray did. Ray actually took the message from the voice the wrong way, but he felt strongly enough in it’s direction to risk everything else. Each character has their own path, yet something out there is orchestrating it all to where they become intertwined. Ray’s destiny is to reconcile with his father, help others find their way and create a slice of Heaven on earth for others to partake in. Terence Mann’s destiny (no, he didn’t die when he disappeared into the cornfield) is to experience something so profound it will ignite his passion to write and influence others again. Shoeless Joe and his seven teammates were granted their heavenly wish to resume playing ball. Even Mark, depicted as the bad guy, is really just being the practical anti-Ray out of love for his sister and keeping her livelihood intact. The truest depiction of destiny at work in the film falls with Dr. Archibald “Moonlight” Graham. When Ray inexplicably finds himself in 1972 and meets the aging Dr. Graham, he is told that his biggest wish was to get an at-bat in a big league game, hopefully knocking a triple after winking at the pitcher. When Ray later picks up the ghost of a young Archie Graham hitchhiking his way through the Midwest, he believes it’s an obvious solution to Graham’s plight. Things fall right into place as Archie plays a game that very night at the Field, and hits a (metaphorical as we’ll see) sacrifice fly. The next day, Graham is in the lineup again, but races off the field to rescue Ray’s daughter Karin who fell from the bleachers and was choking on a hot dog. After saving her, Ray realizes that Archie cannot return to the field to keep playing. He had literally and metaphorically crossed over into who he was supposed to be. The hesitation by Archie to take that last step, and later reassuring Ray that it was perfectly OK that he can’t return, implies that Archie knew his destiny all along – to be a doctor, not a ballplayer. Archie’s character theme, when applied to his own path, was sacrifice. He first sacrificed continuing pursuit of his baseball dream to become a doctor. He later sacrificed his second chance at it to save Karin by way of that profession. (Remember that SAC fly he hit? It fits now, doesn’t it?) With that final selfless act, he was able to help fulfill Karin’s immediate destiny, which was to come up with an idea to keep the Field and her family’s land. Side note: Sadly, it is not known if Archie Graham ever got to play a full game. If his SAC fly was his only plate appearance the night he arrived at the Field (he could’ve been pinch hitting or was pulled before his next time up), and if he crossed over to save Karin before batting the next day, then he still never technically got his official big league at-bat. Though he did at least get one appearance at the dish, plus his wink at the pitcher, so perhaps that was good enough for him. The eight White Sox players, and many others, get to play ball again. Moonlight Graham gets his plate appearance and pitcher wink. Terence Mann will return to writing. Ray and John get another shot at their relationship – this is the arguably the whole point of the film. The Japanese poster (famous for spoilers) for the movie nailed the plot, describing the movie as being about a man on a quest to meet with the ghost of his father. What all storylines in the movie boil down to, is really just that. Ray hears three messages from the voice and he incorrectly assumes them to be about Shoeless Joe, Terence Mann and Moonlight Graham, in that order. While he was able to positively affect each person, and was probably supposed to, all three messages were actually intended to be about his father. At the end of the film, we of course see the emotional reunion of Ray and John. Baseball was just the means to that end. It was the one thing the two of them had in common, and the one thing that reunited them. All other characters got their second chances with baseball being the catalyst – but not the focal point – and it’s important to know the difference. The real Moonlight Graham played his half inning in 1905. In the movie it was 1922. Insignificant detail, but still. Later in the movie you see what looks like a few Philadelphia Athletics players on the field, only their uniforms have green sleeves and socks. When the A’s were in Philly their colors were white and blue; they didn’t adopt the green until they moved to Kansas City in 1954. I suppose those could’ve been minor league or other non-MLB players though. If this was a movie intended to be squarely about baseball, then you might think little details like this would be smoothed out, more historical players mentioned, and more intricate scenes of the game itself shown to appease the purists of the game. Alas, while baseball is obviously and profoundly present throughout the movie, there is a lot more involved than just that. Let’s also not forget that the movie is based on a wonderful novel, in which even more elements and themes are present. Baseball in Field of Dreams is a huge backdrop, but not the full picture. Admittedly, there is not really a wrong answer. It’s all how you see it. October 1, 1970 was a sad night. Not sad in a truly horrible, end-of-the-world sort of way, but in the way you feel when selling a beloved car or moving out of your childhood home. The way it reminds you of a cherished memory, happy and yet tragic at the same time. You see, that day was the final game at Connie Mack Stadium, better known as Shibe Park to those of us who grew up nearby lovingly remember it. Boy, that final game sure was a classic. Even though for the past 15 seasons it was no longer our beloved Athletics on the field, we still cherished every inning played at the ‘ol yard. We had all secretly hoped the game would last extra innings, just to drag out the inevitable end just a bit longer – and it did! When the 10th inning began, for just a second it felt like the game, and the stadium, might last forever. Even after Oscar Gamble’s single drove in Tim McCarver to give the Phillies a 2-1 victory, the echoes didn’t dissipate for what seemed like hours. The looting afterward was not surprising, and even with all that chaos and people running out of the park with everything they could carry – seats, bricks, buckets of dirt and grass, it was still a bit funny to us to see someone running off with…a toilet. A beat up old toilet with green paint splashed on the tank. When the four of us – myself and my childhood friends Charlie, Donnie and Slim – saw this shameless toilet thief, none of us said a word. We just shot a smirk at each other and then proceeded to unbolt seats of our own, the same seats we had occupied for over 40 years, since we first started going to watch the Philadelphia Athletics as kids in the late 1920’s. We were all bummed when the A’s moved to Kansas City at the end of ’54, but we continued to go to Shibe anyway. Not because we were huge fans of the hapless Phillies who’d moved in by then, but we were in love with the ballpark itself. It’s history. It’s feeling. It’s meaning. For it meant something to us, it truly did. That final night reminded me of the first time we visited, or rather broke into, Shibe. Like most neighborhood kids, we grew up loving baseball and loyally following the A’s. If you lived just a few blocks away you were probably a Phillies fan but where we lived, it was the A’s or nobody. Connie Mack was a God and Shibe Park was his Church. No matter where we were out playing in those summers, our paths always seemed to lead us to the ballpark, like an unseen magnetic force. None of us had attended a real game there yet, but we would always be nearby anyway, soaking up the atmosphere. The iconic four-story tower behind home plate at the corner of Lehigh and 21st, where we knew Mack’s office sat at the pinnacle, was the most important landmark to every eight-year old kid in the area. Sure, we would traipse the few blocks over to the Baker Bowl to see what the Phillies were up to on rare occasion, but it didn’t compare to the vibe at Shibe whatsoever. One of those summer days in ‘25, Slim earned his nickname, and we earned our stripes. The A’s were on a western road trip (really the Midwest since no team existed further west of St. Louis in those days), so the neighborhood was quiet and largely empty. We were doing our usual thing, hanging around the park, when Slim, aka Mikey Donatelli, noticed that behind the wooden right field wall near where it joined to the first base grandstands, were some damaged boards. A gap. To the four of us, looking through that hole in the wall out at the empty seats and the vast sea of emerald green grass was like peering through a rip in the veil that separates the earth from heaven. As we noticed there were no security guards nearby, we desperately wanted to get inside the park. Not to mess with or take anything – of course not – but just to experience it firsthand. The problem was, the gap was just too small for us to fit through. Except of course, for Mikey. We hatched a brilliant plan for him to wiggle through the opening and sprint, hugging the grandstands to minimize his profile, to the first base side concourse and let us in one of the locked grandstand doors. It was almost too easy, even to our youthful minds. To our amazement, the nefarious scheme worked like a charm. As Mikey slid through the gate and made a beeline to the concourse, we decided his nickname was to be changed from “Teapot” to “Slim.” Nobody really knew where “Teapot” came from anyway, though it was suspected it was given to him by an Aunt after some sort of kitchen mishap. But that’s not important right now. When the door on the 21st street side opened to us, the feeling of euphoria was nearly too much to handle. Instead of doing what most kids would do in that situation – go on the field and run the bases, sit in the dugouts, venture down the tunnel to the clubhouse and secret passages under the stadium – we simply sat. We walked halfway up the third base line, picked four random seats and just sat. And revered. And kept quiet. We were mesmerized. Before we knew it, nearly an hour had gone by and we didn’t feel too guilty or even apologetic when the good-natured security guard shooed us back out the very door we entered from. Nor were we surprised when our secret gap in the fence was repaired the very next day. But we had accomplished something, we felt, that not only elevated us to grand status in the neighborhood but cemented in us a pure love for a piece of architecture that wouldn’t dissipate. In fact, two years later after much begging and negotiating, all our families agreed to purchase four season tickets, in those very four specific seats. Good thing we did, then, because times got pretty tough a couple years later. As we were being ushered toward the door, Charlie O’Toole, the quietest of our group despite being part of a boisterous Irish-Italian family was walking several paces behind the rest of us when he spied something. The door to a small storage room at the bottom of the rotunda was left open. Peeking inside, Charlie noticed among the clutter a few buckets of used baseballs in the room. Never one to miss out on a souvenir, he pocketed four of them, one for each of us, to mark the occasion. I still have mine today, and I assume the other guys do too. I often stare at it while it’s perched in its case, along with lots of other A’s memorabilia, and next to the seat I left Shibe with that night. It’s impossible to know the true story of each ball of course, but I think it’s better that way. To me, I believed my ball was once in play, right there on the majestic Shibe Park field, and used by the game’s greats. It was once, perhaps more than once, slugged by Babe Ruth. It was a would-be triple robbed by Tris Speaker. It was slung by Walter Johnson and gracefully fielded by Eddie Collins. I’ll always believe all the above are true when I look at the ball that Charlie confiscated for me. Along with the seat, holding on to pieces of Shibe allow her to exist even though she’s gone. The storage room, Charlie said, also served as a small bathroom. As he pocketed the baseballs, the splashes of green paint he noticed all over the toilet wouldn’t seem significant to us for another 45 years. Coincidences happen, of course. But on occasion, some situations can foretell what’s to come. Baseball analysts and sabermetricians have been on the hunt for the Holy Grail metric; that figure which can predict what a player will, or at least very likely do, for years. Where Carl Mays was concerned, predictability was nearly impossible. Actually, it was scary. The submariner had something of a tumultuous career, and a personality that wasn’t quite favorable among players and coaches in the majors. Moreover, he was a spitballer, and combined with his unique delivery and blazing fastball it made him a formidable, if not dangerous pitcher. This stigma was strengthened in 1915 during a fiery encounter with Ty Cobb and the Detroit Tigers. Mays, pitching for the Red Sox, repeatedly threw at Cobb each at-bat during a game, prompting Cobb to throw his bat at Mays in the eighth inning. Once things calmed down, Mays responded by plunking Cobb on the wrist (1). For whatever malice he may or may not have pitched with, he appeared to have no fear or shame. Still with the Red Sox in 1918, Mays and his team were enjoying a fantastic season, one that would end with a World Series Championship over the Chicago Cubs. Mays was the ace of the staff that season, going 21-13 with a 2.21 ERA, tossing 30 complete games and tacking on eight shutouts over 293 innings pitched. Earlier in the season on May 20, an incident occurred which, unbeknownst at the time, would portend an eerie and deadly second act. In the third inning of an 11-1 rout of the Cleveland Indians at Fenway Park, Mays let loose a pitch that drilled the great Tris Speaker right on the head. The extreme nature of this beaning only firmed up the already deplorable M.O. that Mays garnered. Nobody could’ve seen what would happen two years later. In keeping pace with the high-high’s and low-low’s of his career, later in the 1918 season on August 30, Mays became the only pitcher in Red Sox history to throw two complete game wins in the same day. Both wins were integral in keeping the Red Sox atop the pennant hunt. The frightening beanball Mays laid on Speaker’s noggin was, in hindsight at least, notoriously prophetic. In 1920, Mays, then pitching for the Yankees, would be the instigator of tragedy. In one of the most infamous moments in baseball history, Mays hit Indians’ shortstop Ray Chapman on the skull, killing him. Mays always vehemently denied throwing at Chapman intentionally, and even went so far as to attempt blame on Chapman for crowding the plate. Two years, two Indians players hit on the head, and one sparkling young player killed. This incident would haunt Mays for the rest of his life. Chapman’s death ignited a series of rules changes that are still in use today. Beginning shortly after the tragedy, umpires began to insert new baseballs into the game when the one in play became scuffed or too dirty. The spitball and other doctored-up pitches were outlawed, and although it took over thirty years to be fully integrated, batting helmets began to be used. Mays’s career continued with success, despite a permanently damaged reputation after the Chapman beaning. In 1921, Mays had the best season of his career when he led the league with 27 wins and 336 innings pitched. He helped lead the Yankees into the World Series against the New York Giants but his sterling season was marred amid accusations that he was offered a bribe from gamblers to throw Game 4 of the World Series. As the alleged story goes, Mays’ wife Marjorie signaled her husband that she had received the bribe money and the pitcher was now in the bag. Mays, who had been dominant up until then, started crossing up his pitch signals and became lackadaisical, allowing the Giants to clobber him and take a lead they would not relinquish (2.) The Giants went on to win that game and eventually the best-of-nine-series, five games to three. Though cleared of any wrongdoing, the rumors of conspiring with gamblers felt like salt in the wound of baseball, with the Black Sox scandal of 1919 being so fresh in everyone’s minds. Mays would pitch until 1929, ending a 15-year career and all told, his numbers were excellent. He compiled a record of 206-127, with 29 shutouts and a 2.92 ERA. He won 20-plus games five times. Still, he has been left out of the Hall of Fame, despite having career statistics that would make him worthy of the accolade. His ugly reputation, combined with suspicion of throwing a World Series game and Chapman’s death are the likely scapegoats of Mays not being enshrined.